Making oobleck was one of the very first science activities I wrote about on Science Sparks. I’ve given this very old post about how to make oobleck a bit of an update and refresh so I hope you like it! Gloop or oobleck is just cornflour and water. It’s very easy to make and creates a lovely gooey slime which feels solid when you scrunch it up and liquid if you let it flow through your fingers. Colander, funnel and beakers – optional, but great for messy fun! Add water very slowly mixing with your hands, until you get a sticky, slimy gloop. Play with the slime and see how it behaves. Can you make it into a ball? and what happens if you throw it onto the floor? Did you notice that if you make a ball with oobleck or gloop it feels solid, but if you drop the oobleck on the floor it turns liquid again? The slime is a non – Newtonian fluid as it doesn’t flow like liquids normally do. Cornflour gloop ( oobleck ) is made up of molecules arranged in long chains. When the chains are stretched the liquid will flow, but when you force them together they stick together to form a solid. Pretend you’ve run out of superhero slime, can you make some more? – this activity an also be found in Science Sparks the book, along with extension ideas and links to maths and English. Try squeezing the cornflour into a ball, it should feel solid. 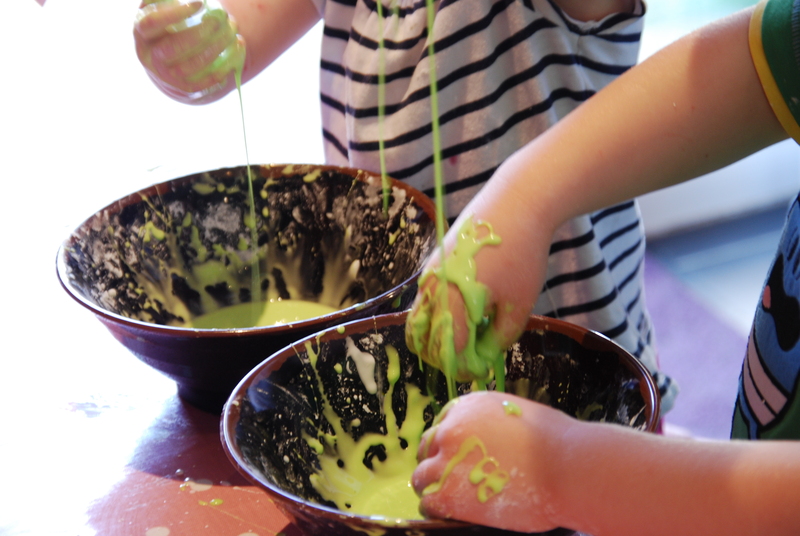 Open your hand and watch as the cornflour slime runs through your fingers. Can you freeze the gloop? Our frozen Kool Aid oobleck smelled wonderful. Try pouring the slime through a colander, what happens? Can you use the slime to trap a small figure or pretend spider? The always amazing Babble Dabble Do has even more fun Oobleck activity ideas for you, so don’t forget to check out her blog. 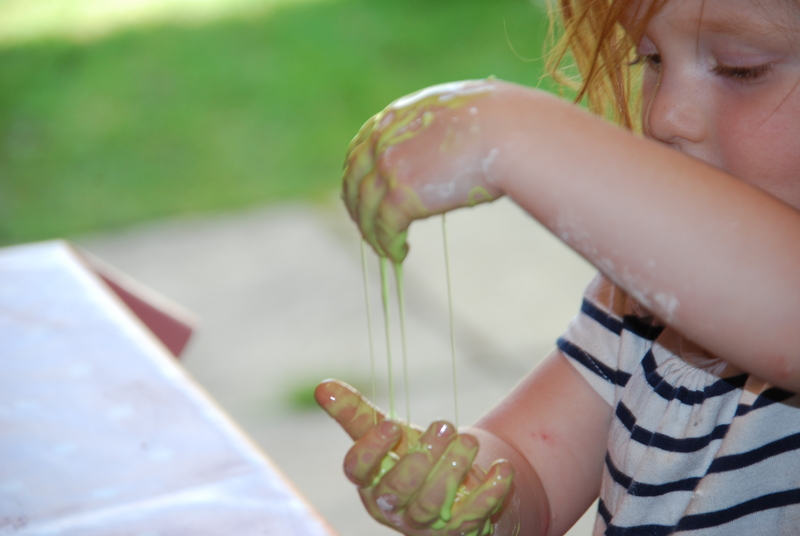 The Artful Parent has some great oobleck play ideas. Housing a Forest makes oobleck dance! Can you squeeze the slime into a ball? What does it feel like? How long does the ball stay solid after you let go? If you used less water do you think the slime would fall faster or more slowly through the colander? I always loved this activity. A favourite was rolling a ball in the hands then handing it to a child and watching it collapse. I would then ask what they thought had happened. Their responses could be very creative. Ooo, going to have a go at this one ! you learn something every day – something to pay around with when mu daughter is older. Please keep your blog going so I can refer back to it. you learn something every day – something to pay around with when my daughter is older. Please keep your blog going so I can refer back to it. My kids love to make this stuff! Great post- Thank you for linking up to The Sunday Showcase. Glad you could make it.